Rain the poured throughout the weekend forced the A’s to postpone Sunday’s game. Even though the rain was subsiding as planned first pitch time (1:05) approached, Later that day the team announced that the game would be made up in September, as the back end of a natural (single admission) doubleheader on Saturday, the 9th. MLB guidelines along with union preferences and financial pressures usually call for teams to schedule makeup games on off days, or if a doubleheader is absolutely necessary, a split or day-night doubleheader with separate admissions. Of course, this is the A’s we’re talking about, so they may actually benefit from one day’s admission more than two. Tickets for the postponed won’t be honored for the doubleheader because it’s not a new date. Tickets have already been sold for the original 9/9 game, so fans can trade in another date on the home schedule. That should also mean that they can trade in for 9/9, but there’s a good chance that their seats will be marginally worse. Best way to find out is to contact Ticket Services. As for what caused the postponement, remember that it’s been three years since the last postponement, also caused by a soggy field. Back then, the tarp was left off the field in hopes of some of the water evaporating. That’s quite different from the normal way of getting rid of water: gravity. Modern fields have some form of drainage system to move water out of the ground quickly. That works most everywhere except for the Coliseum, where the field remains 22 feet below sea level and is subject to tidal actions. On Sunday the tide was to start coming in as the game started, reaching high tide around the end of the game. On Monday night, high tide hit at 5:30 PM and was to recede as the night progressed. That allowed the A’s to start the game with some confidence, even though a shower hit in the late innings. DIY Network provided the blurbs above, which explain how the drainage systems work. The Coli’s system was done as part of the 1995 Mount Davis renovation, though the brief period between football and baseball seasons did now allow for a complete rebuild. The Giants’ system is interesting in that it uses a vacuum pump/air system to force water out. The field is 9 feet above sea level, which means it could be tidally prone on some occasions. Coincidentally, the Coliseum parking lot is also 9-10 feet above sea level. Any new ballpark there should have its field at least at grade or higher to deal with climate change-related sea level rise. Howard Terminal and Brooklyn Basin are at elevation 11-12 feet, and being waterfront should be subject to similar standards. Laney College is terraced, going from 13 to 30 feet from south to north. Whatever location is chosen, great care and thought will have to go into stadium placement, footprint, and orientation. In the modern era, that’s gonna have to include elevation as well, at least as long as you’re building along the bay’s flatlands. ← The tarps are dead (upper deck)! Long live the tarps (Mount Davis)! ” Any new ballpark there should have its field at least at grade or higher to deal with climate change-related sea level rise.” Yup. That 2 cm per year (worst case scenario per the US NRC, IPCC has it at 1.0-1.5 cm per year) is really gonna put a dent in the field level design. A more likely field elevation scenario is when the inevitable Hayward Fault earthquake comes and completely rearranges the entire Bay tidal marsh in one shot. Better to be farther inland (Laney) than right on the water (HT) in that scenario. Laney is not much better than the other sites as far as liquefaction goes. 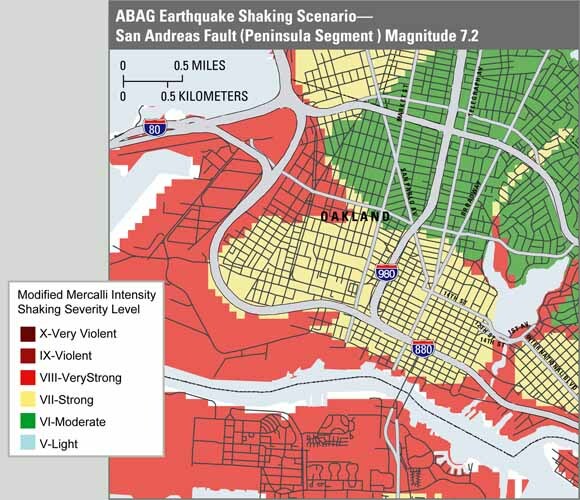 Looking at that map, looks like the A’s best bet (at least seismically) is 980 Park. The only plus to the constant wait we’ve all endured for a future A’s stadium: every year we get more information – about the changing technology, the economy, the weather, other teams’ stadium successes and failures, etc. – that help make it more likely that it will be done right when it is finally done. Yea, we can use the technology that the Braves use in their next new stadium. Cool. Does that also mean they’ll build it at the 101/580 split in San Rafael and provide no additional parking? how many new parks will be built? a’s and rays of course are looking to build new parks for years now. but then you got teams like the angels who also play in a older park and probably want a new venue eventually. is that it? would the blue jays want to build a new a smaller baseball only park and get out of the 55k capacity rogers center? dbacks have been speculated in wanting to build a new park too even though chase field it’s less than 20 years old. but as we’ve seen two other teams with fairly new parks have built or going to build a new baseball park with the braves having just opened suntrust and the rangers who’s opened up new parks in the mid to late 90s? so that’s how many teams at the most? …five teams who could want a new park down the road? really can’t envision other teams wanting to build a new park and those who do have “older” newer parks built and opened in the 90s like the white sox have just renovated theirs in recent years. The Giants will never leave AT&T. The Rockies made a land deal with the city of Denver a few weeks ago to buy land adjacent to Coors Field (and they not only paid for it, but at a fair value according to Field of Schemes) so it would be foolish for them to vacate. Here in the northwest, the M’s are very happy with Safeco and it is still considered a fine baseball venue by everyone – (plus the odds of them getting a future stadium paid for would be miniscule at best even if they had the Coliseum or the Kingdome). Every so often you hear rumors of one day the Dodgers leaving Dodger Stadium, but I don’t believe it will ever happen esp since they own the parking lots, right? I do think eventually (like a long time 20 years or so from now), the Twins will use the argument that they’ll need a roof (or whatever technology is in place) due to their climate. EDIT: as part of the deal with Denver, the Rockies will stay at Coors for another 30 years. That is something I like, because Coors is a great ballpark (unless you’re a pitcher). I saw a single admission DH there and loved the design.